The South African Embassy in Seoul marked the 24th anniversary of Freedom Day -- a national holiday commemorating the first post-apartheid elections in 1994 -- at a reception Thursday. “What is special about this year’s celebration is that it coincides with the centenary on July 18 of the birth of our icon and symbol of peace, late former President Nelson Mandela,” said South African Ambassador to Korea Nozuko Gloria Bam in a speech. Newly elected South African President Cyril Ramaphosa -- previously an anti-apartheid activist, trade union leader, businessman and the nation’s deputy president from 2014 to this year -- launched an ambitious foreign investment initiative in mid-April, with the aim of luring in at least $100 billion in investments over the next five years, Bam said. 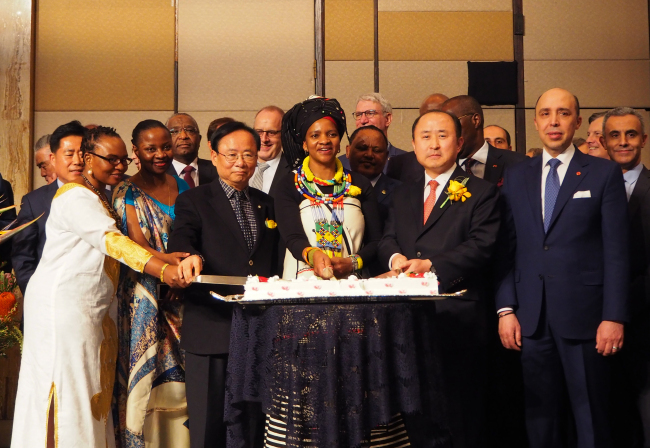 “The message is clear -- South Africa has entered a new era of hope and confidence,” she stressed, adding that annual meetings between the African Development Bank and Korea-Africa Economic Cooperation secretariat would help accelerate Africa’s industrialization. South Africa and South Korea also mark the 25th anniversary of diplomatic relations this year. The two countries agreed in 2013 to elevate their bilateral Policy Consultative Forum -- on the level of deputy ministers -- to the Joint Commission of Cooperation -- on the level of foreign ministers -- which would allow the two ministers of foreign affairs to meet annually and discuss wide-ranging issues from politics and security to trade and investment. The joint commission is expected to be implemented within this year, and is evidence of both sides’ seriousness to engage with one another, according to the diplomatic mission, as it can pave the way for a presidential summit. “South Africa commends the government of the Republic of Korea under President Moon Jae-in’s leadership for its efforts toward ensuring peace and stability on the Korean Peninsula,” Bam said, wishing for a successful summit between Moon and North Korean leader Kim Jong-un on Friday. In 1989, South Africa became the first, and so far only, country to have developed its own nuclear weapons and dismantled them. Ukraine, Kazakhstan and Belarus relinquished inherited Soviet nuclear weapons that were in their territories following national independence. Former South African President Frederik Willem de Klerk (1989-94) took two crucial steps to improve South Africa’s then-deteriorating relations with the world under the apartheid regime. “The first was to release Nelson Mandela, and the second was to dismantle our nuclear weapons and accede to the Nuclear Nonproliferation Treaty,” de Klerk wrote years later. South Africa acceded to the treaty in 1991, and de Klerk publicly acknowledged the nuclear program’s existence for the first time in 1993, the year the International Atomic Energy Agency certified the country’s nuclear dismantlement. “While economic pressure (international sanctions) did eventually play a role in South Africa’s decision to denuclearize, the process took more than a decade,” journalist Joshua Keating wrote in an article for Slate in March. Yun Kang-hyeon, deputy minister for economic affairs at the Korean Ministry of Foreign Affairs, lauded South Africa for ending over 300 years of colonialism and segregation with the establishment of its first nonracial government led by late Mandela in 1994. South Africa is Korea’s largest African trade partner. The two economies had $3.2 billion in bilateral trade last year, skewed in favor of South African exports, according to the diplomatic mission. Pointing out South Africa’s national philosophy of “Ubuntu” -- meaning “human kindness” or “a universal bond of sharing that connects all humanity” -- Yun said the concept is in tandem with the current Moon administration’s focus on serving people first. The Korean diplomat also thanked the over 3,000 South African English teachers in Korea, calling them “civilian ambassadors” connecting the two countries. The Korean Ministry of Foreign Affairs will establish the Korea-Africa Foundation in May as an affiliate organization, which will conduct long-term, comprehensive research and analyses on Africa and promote Seoul’s exchanges and cooperation with African states. Former Korean Ambassador to South Africa Choi Yeon-ho will be the foundation’s first-ever chair.